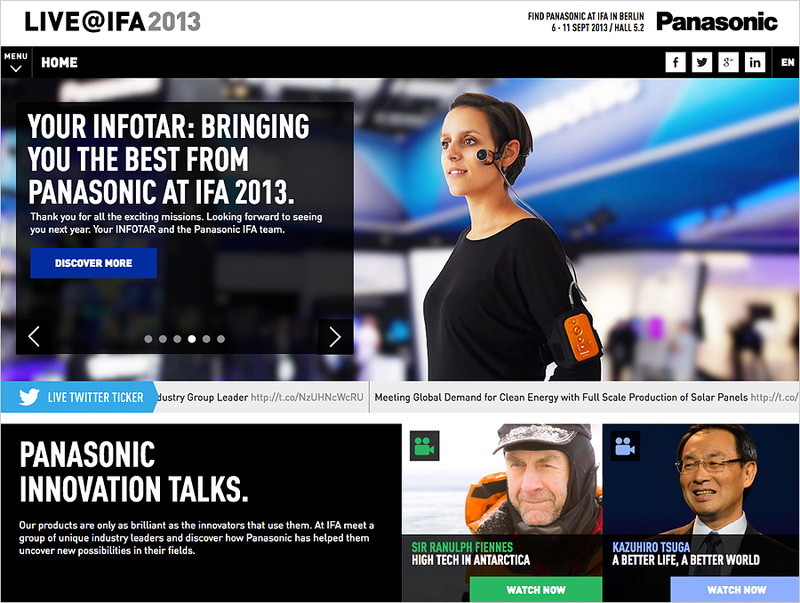 We created for Panasonic a web campaign for their 2013 IFA activities. The IFA is Europe’s biggest consumer electronics fair. Our ideas that convinced Panasonic was an combination of an increased quality of the consumer relevant content, more user interaction, and a cooperation with a strong media partner (Mashable). The Microsite brought cast the “Panasonic Live Press Conference” using Ustream and entertained the users in the “Innovation Talks” section with interesting interviews of leading personalities in technology. In the “Ask Our Expert” section were enable the user to submit via Twitter and Vine product related questions to Panasonic product trainers. The highlight of the campaign was the INFOTAR section where users could submit a task to our Panasonic POV camera equipped “Expert Team”. Special trained Panasonic product experts brought casted live via Ustream answers to any submitted user question. The site was programed in a responsive design and optimized for mobile and tablet devices.